This step by step diy woodworking project is about lounge chair plans. If you want to learn how to build a beautiful chaise lounge chair, we recommend you to pay attention to the instructions described in the article and to check out the related projects. 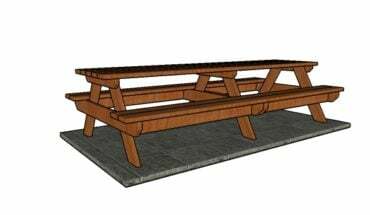 There are many storage projects featured on our site, so don’t be afraid to browse through the rest of the woodworking plans. Before starting the actual construction project, we recommend you to plan everything, as to save money and to keep the costs under control. Adjust the size and the design of the lounge chair to suit your needs. In addition, we recommend you to invest in high-quality materials, such as pine, redwood or cedar, as they have a nice finish and are highly durable, especially in a humid environment. The first step of the woodworking project is to build the components for the frame. Use 2×4 lumber for the legs and 1×4 lumber for the frame. Use a circular saw and a chisel to make a notch to the top of the legs. Smooth the area with fine-grit sandpaper and remove the residues with a damp cloth. Use a jigsaw to round the ends of the side supports. Fit the legs to the frame and secure them into place using 1 1/4″ screws and water glue. Leave no gaps between the components and take accurate measurements. Build the interior cleats out of 1×1 lumber and secure them to the frame using 1 1/4″ screws. Add glue to the joints and remove the excess with a damp cloth. Make sure the cleats are placed 3/4″ under the top of the lounge chair. Build the braces out of 1×4 lumber. Use a circular saw to make 3/4″ x 3/4″ notches to the top corners of the supports. Drill pilot holes at both ends of the supports and secure them to the side components by using 1 1/4″ screws. Add glue to the joints and make sure the corners are square. Use the information in the diagram, to see how to install the braces to the sides of the lounge chair. Make sure the corners are right-angled before continuing the project. Fit the 1×3 slats to the cleats, making sure you place them equally-spaced. Drill pilot holes through the slats and secure them into place using 1 1/4″ screws. Add glue to the joints and make sure the edges are aligned properly before driving the screws in. Continue the woodworking project by creating the supports for the backrest. Use 1×2 lumber to build the frame, as well as the stops. Drill pocket holes along the side components and secure them to the frame using 1 1/4″ screws. Add glue to the joints and make sure the components are perfectly horizontal. Build the adjustable support for the backrest out of 2×2 lumber. Drill pocket holes at both ends of the horizontal support and insert 2 1/2″ screws into the vertical supports. 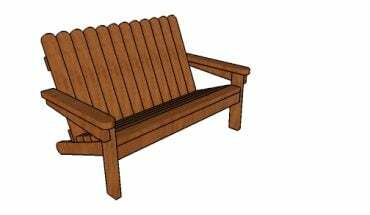 Build the sides of the backrest out of 1×2 lumber and the slats out of 1×3 slats. Drill pilot holes at both ends of the slats and secure them to the supports using 1 1/4″ screws. Add glue to the joints and make sure you place the slats equally-spaced. Drill pilot holes through the top and the supports and secure them to the backrest frame using screws. Make sure the supports slide easily, so you can adjust the position of the backrest. Last but not least, we recommend you to take care of the finishing touches. Fill the holes with wood filler and let it to dry out for several hours. Check out the rest of the projects, to see more ways to improve the look of your garden. Smart tip: Apply several coats of stain or paint to the wooden components, if you want to protect them from decay and to enhance the look of the lounge chair. Thank you for reading our project about lounge chair plans and we recommend you to check out the rest of the projects. Don’t forget to share our projects with your friends and LIKE us, by using the social media widgets, if you want to be the first that gets our latest articles and to help us keep adding free plans.